1 Gross,(144), pieces of #4 Rolled Rim Spur Grommets. 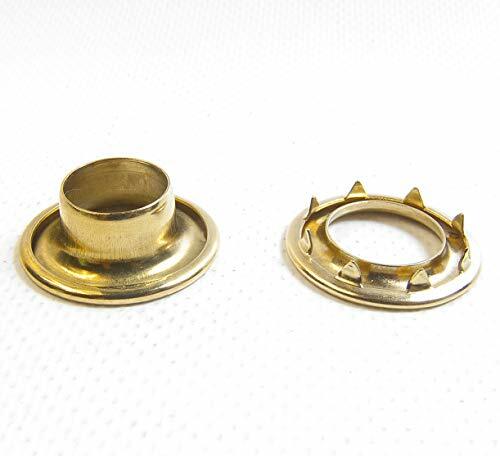 This #4 rolled rim grommet and spur washer pair is made to support holes in a variety of fabrics. Made from heavy-gauge brass, these compact but durable parts can stand up to any type of climate. The rolled rim grommet provides a slightly thicker material. The spur washer offers more teeth than a tooth washer. When the two come together, this grommet and washer pair offers the most robust and stable option. Since they don't move around after installed, this makes them optimal for rugged applications that encounter movement, like for use on boats. Easily cut a hole into the fabric then install the metal grommet and washer with the appropriate setting tools. While ideal for curtains, drapery, and vinyl banners, they also operate well in custom awning, outdoor upholstery, and marine jobs. Specific uses consist of awnings, seats, boat covers, flags and banners, luggage, privacy drapes, safety gear, signs and media, outdoor tents, and tarpaulins. The hole's inner diameter measures 9/16". 1 gross = 144 grommets and 144 washers (288 pieces total). If you have any questions about this product by #4 Rolled Rim Spur Grommets, contact us by completing and submitting the form below. If you are looking for a specif part number, please include it with your message.